RUSH: Grab audio sound bite No. 3. Last night, Jimmy Kimmel Live. He really is making a joke of himself. If any of you out there know Jimmy Kimmel and care about him, you’ve got to somehow get through to him that he’s got to stop using Chuck Schumer’s office to inform him on health care and now whoever is informing him on guns, because they’re making a fool of him. And he’s not alone. So many in the media are making fools of themselves. But at this time they are getting away with it because of the massive ignorance on the part of many in their audiences. Now, keep in mind as you listen to this, this is a late-night comedy show. This was last night during the monologue. KIMMEL: Tell Paul Ryan and Mitch McConnell and Marco Rubio, all the family men who care so much about their communities, that what we need are laws, real laws, that do everything possible to keep assault rifles out of the hands of people who are going to shoot our kids. Force these allegedly Christian men and women who stuff their pockets with money from the NRA year after year after year, to do something now. Not later. Now. And don’t you dare let anyone say it’s too soon to be talking about it, because you said it after Vegas, you said it after Sandy Hook. You say that after every one of these eight now fatal school shootings we had in this country this year. (crying) Children are being murdered. The NRA, yet again do I point out, is not a major American political contributor. 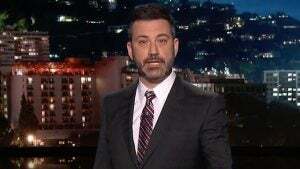 Not nearly to the degree that Jimmy Kimmel thinks. He’s been lied to about it and he believes it. Again, in the last 20 years the NRA has spent $200 million on politics. In last year, the last year, the unions spent $1.7 billion. Planned Parenthood spends more money on politics than the NRA does. “They’ve got to do something. They’ve got to do something.” Mr. Kimmel, there were all kinds of people that had the opportunity to stop this kid. The FBI was warned and didn’t do anything about it. There are any number of people who knew. It’s disgusting to learn what we knew, what law enforcement, what the FBI, what they knew about this guy and nobody did anything. And now all of a sudden it’s the Second Amendment’s fault? It’s the NRA’s fault? This is my point, we have the mechanism in place to stop this now. But we are never going to solve it if we don’t get off this phony reality that’s portrayed here by people like Jimmy Kimmel. It is really time for adults to step up here. If protecting kids and the children is the objective here, then somebody else needs to take over, because the American media and the Democrat Party do not have a solution. They have things that are going to advance themselves politically, but they do not have a solution. The solution to this is not found in a new gun law. There isn’t a single gun law on the books that would have stopped this. There isn’t a new gun law that would stop this. We’re talking about criminal behavior. We don’t have any defensive measures in place. Schools are buck naked when it comes to defensive measures to protect against things like this. Airplanes are not naked. Sporting events are not naked. This is what our country has become, and sitting there and trying to advance a political agenda at the expense of Trump, Republicans, NRA, is woefully immature and it’s dangerous because it isn’t solving anything. But this is the real pièce de résistance, this next Kimmel bite. And he’s not alone in this one. This is just outrageous, here it is. RUSH: That is flat out incorrect and untrue. Donald Trump did not claim or remove Obama restrictions on the mentally ill in terms of getting guns. That did not happen. And furthermore, it has been debunked, a year ago. It has been debunked. It has been exposed as a lie. But Jimmy Kimmel doesn’t know it because the source for his information is obviously some partisan Democrat’s office informing him so his monologue writers can put together this gibberish. The accusation that a bill designed to remove restrictions and allow the mentally ill to buy guns was passed by the Republicans and signed by Trump has long ago been debunked. Here’s what was removed. The rule that was removed would have allowed bureaucrats within one of our federal agencies to bar American citizens from exercising a constitutional right on the highly questionable grounds that to be incapable of managing one’s finance is by definition to be mentally defective. So it wasn’t just about guns. There was a regulation that would bar American citizens from exercising constitutional rights and mentally defective was defined as being incapable of managing one’s own finances. The Republicans came in and said, “You can’t define mental illness that way.” Simply saying somebody can’t manage their own finances. I mean, you’re going to deny them their constitutional right. So they ripped it out. There’s never been a provision that says the mentally ill will no longer be allowed to buy guns and it was ripped out. That was never in existence. It was never a part of any law. The Democrats and the media are totally lying and making this up. It has been debunked for over a year and they keep using it. Kimmel’s not the only one that’s been beclowned and fooled by this. And the NRA didn’t even support this. And yet they’re being lumped in here as guilty. You know who supported it? The ACLU. And the American Association of People With Disabilities, they supported this. A bunch of leftists supported the Obama rule.